This product is used after coating with Crystal Glow to advance its finest deep gloss and water repellent effect. Crystal Glow is popular due to its clear, glass-look coating layer which brings out deeper gloss and better water repellency. This product significantly improves the glass coating features for greater enjoyment by car lovers with a simple application. 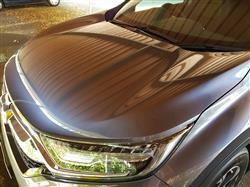 The product can also be used with cars whose Crystal Glow has been applied several months ago. Anyone from beginners to experts can get the same high-quality finishing and effects! Application is straightforward: after applying Crystal Glow, apply Water Repellent Accelerant and wipe off. Put plenty of Water Repellent Accelerant on the included sponge, then apply to paint surfaces and wipe quickly with the attached cloth. Since the process is so simple, it takes very little time even with a big car. "I want a stronger water repellent effect"
"I want my car to be shinier!" Such car owners should try Water Repellent Accelerant! A product developed based on customer suggestions! We constantly gather ideas and opinions from our customers, and we developed this product to meet an especially common need. Taking our customers' suggestions as a reference point, we have worked hard as a professional car care product manufacturer and detailer to satisfy our customers' requests. You should definitely try this product! As with all the Sensha products I’ve used, this product is brilliant. Best water repellent result I've ever seen. THIS ITEM MAKES ME LAUGH!